On the first trading day of 2019 PD-Rx Pharmaceuticals reported its annual results for the 2018 fiscal year that ends on June 30. PD-Rx is one of these stocks that is wonderfully easy to keep track of. 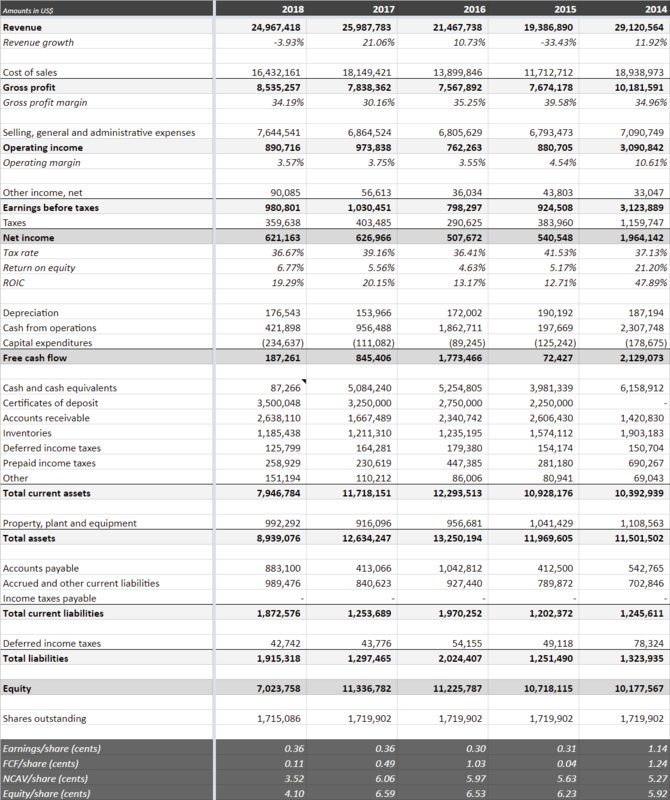 The company releases financial information just once a year, and the two dozen pages that make up the annual report and the accompanying financial statements are easy to comprehend while painting a useful picture of how things have been going. Last year was actually packed with an unusual amount of action for PD-Rx. The company paid a nice $0.66/share dividend in May, and a big $2.20/share dividend in December (after the end of the fiscal year). I was hoping that the dividends signaled that business was going well, but after looking at the latest results it seems that they simply decided to return excess cash. An excellent decision in my opinion, and even after these two dividends half of PD-Rx’s market cap consists of cash and certificates of deposit. Knowing that they are happy to return large amounts of cash to shareholders makes me more confident that we don’t have to place a discount on their remaining cash reserves. Looking at the results of 2018 we see a bit of a mixed result. Revenue went down a bit while their gross profit margin increased. If they managed to keep their SG&A costs stable, 2018 would have been a pretty good year, but unfortunately they didn’t, and as a result they earned exactly the same $0.38/share this year as last year. Especially with a lower effective tax rate in the 2nd half of their financial year that’s a bit disappointing. Some of the increase in SG&A spending can be traced back to increased levels of advertising spending, which presumably isn’t money thrown down the drain, but I can’t say I like the sudden jump, so I can sort of understand why the stock price went down after the publication of the results. At the same time, it also makes that the stock remains a pretty attractive deal. For $4.19/share you are getting $2.09/share in cash and $0.38/share in earnings. You don’t need a fancy valuation model to know that that’s not bad. This entry was posted in Portfolio and tagged PDRX on January 3, 2019 by Alpha Vulture. The special dividends they provide are just useless. Share price drops more than the amount of dividend and also you are forced to pay tax on it. So let’s say you re invest the dividend money in PDRX? You get less shared and u paid tax. So it’s a value destruction. If they don’t believe in the business enaugh to invest in it, than why would you?